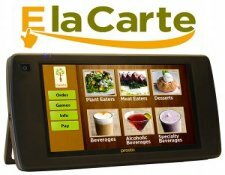 This week we’re pleased to cast the spotlight on E la Carte — a tablet-based restaurant ordering system, headquartered in Palo Alto, CA. What Is E la Carte? E la Carte is a twist on the phrase “a la carte” — the act of ordering menu items individually, as opposed to ordering from a fixed menu selection. The concept of providing choice and interactivity to the diner’s experience was the motivation for E la Carte — a touch-screen ordering system that’s helping to revitalize the restaurant industry. 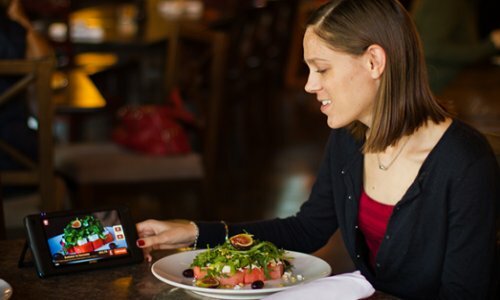 E la Carte provides its restaurant clients with a proprietary tablet called the “Presto.” An individual Presto unit sits atop every guest table in the restaurant. Diners can use the device to preview photos and videos of menu items, order and pay for their meals, and even play “social games” while they’re waiting for their food to arrive! The Presto is not meant to replace traditional restaurant servers, but rather to augment the services provided by the restaurant’s staff. E la Carte serves clients in major cities across North America. According to founder, Rajat Suri, E la Carte is designed to make the restaurant experience “more convenient, social, and fun” for the guests, while making the experience “more profitable for the restaurant owners.” In addition to making the dining experience much more efficient for restaurant patrons, E la Carte offers the following three main benefits to its restaurant clients. Increased Average Check Size: E la Carte claims that the average check size is increased by 10 percent for restaurants using the Presto tablet system. This is based on additional items being purchased as a result of patrons seeing the menu items on-screen, “upselling” opportunities, and “impulse orders” from customers. Improved Service: One of the typical pain points in a customer’s restaurant experience is waiting to pay for the bill or to have his or her credit card returned by the server. E la Carte alleviates this inconvenience by allowing guests to pay for their meals right at the table. The tablets also provide social games to help keep patrons entertained and happy from the time they sit down to the time they leave. Improved Customer Retention: The E la Carte system provides an easy way for a customer to provide feedback to the restaurant, either through instant messaging the manager on duty, completing a survey, or posting a review to his or her Facebook Page. 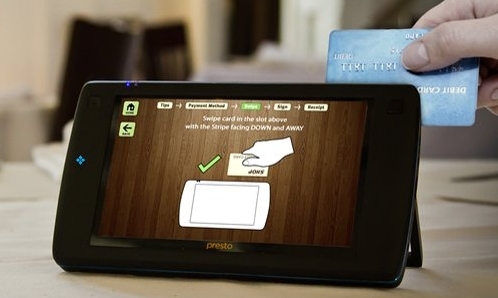 Diners can also sign up for email newsletters and loyalty programs right from the Presto device. E la Carte also advertises a seven minute faster turn time on tables which means more customers can be seated per service. With “no upfront costs” for the hardware, there seems to be little downside for restaurants to give this innovative system a try. E la Carte is designed for restaurants and restaurant-goers, so the obvious benefactors of the system are businesses and individuals who fall into those categories. However, E la Carte suggests that promotions and advertising can be tied-in with the gaming features of the system. This could allow restaurants to offer marketing opportunities to other local businesses in their areas of operation, providing another potentially lucrative stream of income for restaurants using the E la Carte system. Perhaps in response to the demand for its services, E la carte is also looking to fill a variety of technical and sales positions. So, if you’re a restaurant owner looking for a unique way to boost your bottom line, or if you’re an individual looking for a new career opportunity, reach out to E la Carte through its website, its Twitter account or through its Facebook Page.